i first leaned about hanging string gardens from one of my all time favorites, miss lili. she not only harvests these creations herself but if you're lucky she teaches a class from time to time on how to make the little guys. i took one myself and it was such a delightful experience. it is such a special and unique way of handling these gorgeous beasts of nature, that i had to post a few pics that just blew me out of the water. their simplicity and out-of-ordinary way has me captured and really just takes my breath away. of course i'm a real sucker for installations and this would truly be a sight to see in person. a huge window, a wall, a staircase, oh hell - put em' anywhere, i don't care! the work of dutch artist/botanist/crotchet enthusiast Fedor van der Valk has designed all of these above. 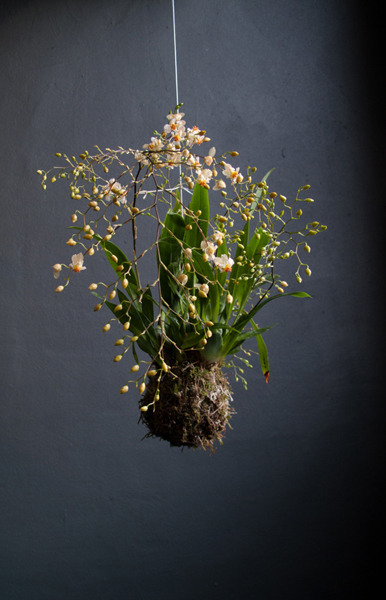 head on over to the string gardens website to view dozens of awe-inspiring photos of literally dangling-by-a-thread plants. YAY for Midsummer Nights Crafts at Shelter Half, and a huge Hooray for Miss Lili's Hanging String Garden Workshop that I personally took. it was so super splendid for a serious amount of reasons: records spinnin, super group of students (including her fabulous mom), getting our hands dirty, inspiring space to create in, sippin' on the bubbly while noshing on a delightful homemade dessert - i mean really, need i say more?!?! her workshop series just ended, however, i will keep you posted if she decides to unveil a new round of goodness.